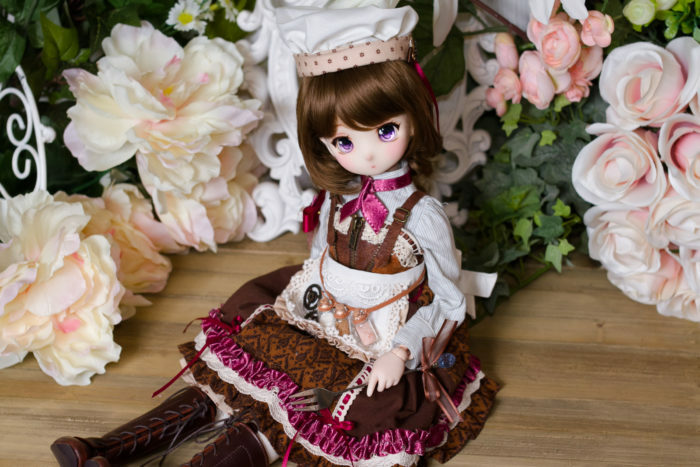 Recently I acquired a Dollce ‘A’ head, an original design they’ve made for custom 60cm dolls. Unfortunately I’ve not gotten any email responses from their contact email so I had to order through a proxy service, but I bet if you’re in Tokyo you can pick the heads up easily at their shop. One nice thing about this head is that there’s no sculpted mouth/lips, so it’s easy to do a variety of cute expressions without the tedious modifications required for most other heads. For now she’s borrowing a NS MDD body, which is near match for skintone. 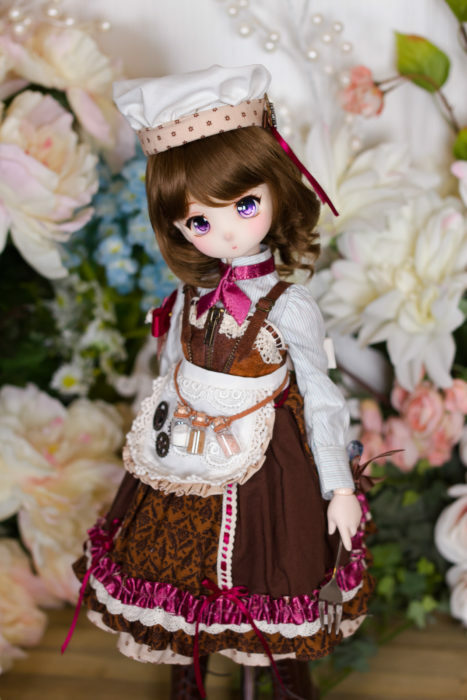 Her outfit is a mix of Volks and hand-made items, and she’s got handmade eyes and a Lullaby Poem wig in these pics. Since I’m testing out using my airbrush with liquitex matte varnish as a sealant, she was my first victim. As this faceup was using experimental materials, I didn’t spend a lot of time fussing over symmetry and design details like usual. Why bother if it could all just fall off in a few weeks? Well, I don’t think these materials will implode but better to play it safe for now. Her eyebrows ended up uneven but otherwise not a bad faceup for a quick job. One downside I noticed is that the liquitex matte varnish results in a rougher surface, which tends to attract dust way more than normal vinyl. I added some satin varnish to try and cut down on the matte varnish’s rough finish, but it didn’t help a lot. I’ll try more satin and mixing in more airbrush medium next time. The Dollce head is a pretty good match for obitsu normal skin, and I think it could work for Volks SWS and NS. Compared to my NS MDD body, the head appears slightly lighter and more yellow in hue. Some of the yellowness is from the varnish, I believe, since her headcap looks less yellow. I didn’t do photos before the faceup so unfortunately I don’t have a great comparison. It’s possible the headcap tone was slightly different, since they appear to be cast in separate batches. One funny thing- the head cap is a pain to get back on the head! It’s got an inner ring to lock in place similar to Volks DD heads, but it’s way too large to pop easily into place so you just have to cram it and squeeze the headcap into position. The eyes tend to stay in place, though, due to the design of the head having a nice seating for 22mm-size eyes. 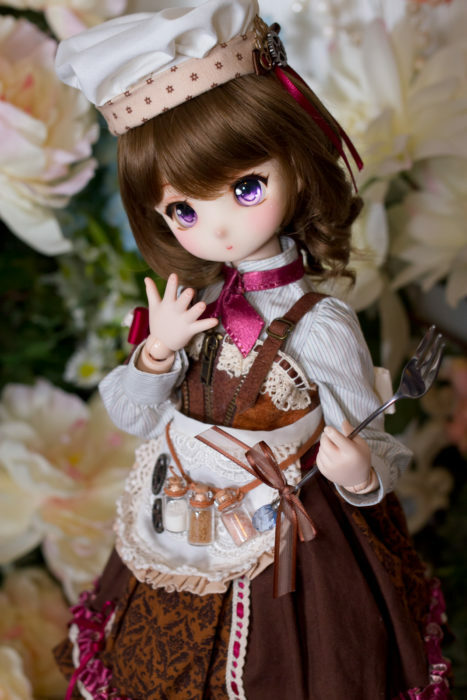 Overall, the Dollce A head is a cute and well-made design that works for both DD and Obitsu bodies. She was really fun and easy to paint, and if I can get ahold of them more easily I’d like to get more Dollce heads in the future!